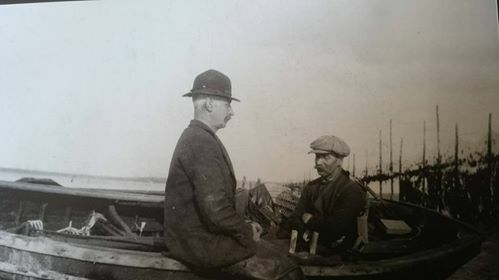 In the early decades of the 19th century traditional fishing methods were turned on its head with the introduction of the Scotch Weir to Ireland. The origins are confirmed by the name, and the method of fishing is typified by what remains of the Woodstown weir near the mouth of the Waterford harbour. The new ice preserving method resulted in the ability to transport fish over longer distances. As a result, the time honoured control over the numbers of salmon caught were no longer necessary. The Scotch weir allowed for hundreds of fish to be taken at a time, and the nets could fish all tides and all weathers (the weekend closure was still enforced however). The basic design was as depicted at Woodstown. A line of poles ran perpendicular to the shoreline, as far and just beyond the "spring" low water mark. 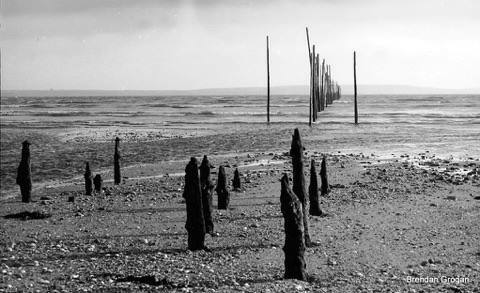 To these poles was attached netting, which guided or lead fish out to deep water. At the end they entered a netting box, with nooks into which the fish butted their heads. Once trapped like this, the fish rarely tried to extricate themselves, but remained to be captured either via a dip net or by hand once the tide had dropped away at low water. The scotch weirs were generally instigated by the landed gentry, who realised the vast financial killing to be made. 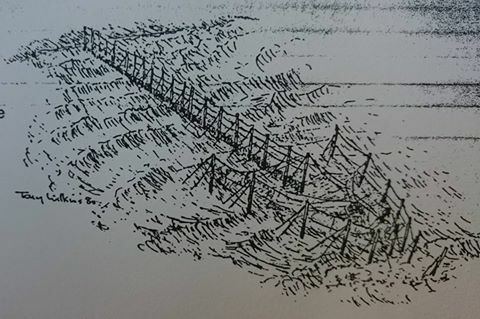 Although traditional nets-men may have complained, initially the weirs were erected unopposed. However, the plight of the traditional nets-men, anglers and some shipping and boating interests led to parliamentary committee hearings, and court cases. Generally to no avail however. for then (as now) the powers that be were either ambivalent or wholly ignorant to the realities of the practice. At hearings the landlords could call witness after witness to say that weirs had been in use for millennia. Laws, when they came, were considered by many to be too little too late. Some of the weirs were removed whilst others were permitted to continue to fish, the Woodstown weir operated into the 1960's I'm told. Two other weirs based on a similar design, but much smaller in size, operated in the Kings Channel into the 1990's. Today only a few poles remain of the Woodstown Weir and beyond low water, some paraphernalia remains of the netting box. The site is now two centuries old and worthy of interpretation at least. I really enjoyed chatting to Billy Coughlan of Saratoga Bar about the weir, he often recalled great catches of different species, even congers that guys were half afraid of they were so large, there were great photos also in the pub of huge salmon loaded on trailers, but don't know if they are still there, I must go in for a pint and check it out.